An awesome reproduction of Michelangelo's "David." This sculpture is cast in pure bronze to last for hundreds of years. This is one of the most famous sculptures of all time. Additional pictures including a picture of the original sculpture are available by clicking the image above. Price includes free shipping in the lower 48 states. This sculpture measures 65" tall. Weight is approximately 200 pounds. 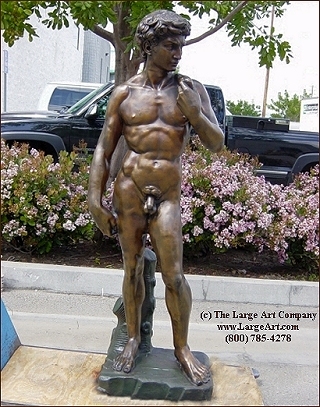 This statue is pictured in classic statuary brown patina (finish). However, we can also do this piece in an antique Verdi green patina.